This is not the time for shyness, there is no need to be bashful, just get up close and have a good old gander. For a change why don’t you try a bee’s eyes view (and they have lots of them – three simple and two compound eyes as you asked). Stick your head into that flower and have a look at what is going on in there. Stigma, style, anthers, filament, they are all lurking there, primed and ready to do their respective jobs. Each species will look different, shape, size, number of parts, this is one of the ways that botanists identify or group plants together. That may be a job best left to the experts but I am sure you will find that the engine room is not only ingenious, it is very beautiful. Wow! It looks like the view inside a kaleidoscope! Ingenious and beautiful, for sure. It is beautiful–great capture! 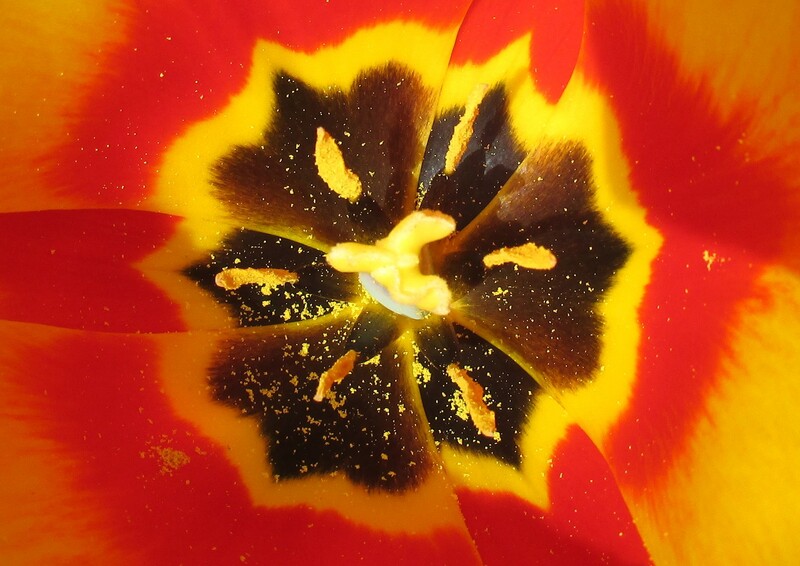 Love that sprinkling of pollen, the colors and well, just the whole darn thing! The pollen was my favourite bit too!